Home > Blog > Are Multilateral Development Banks Supporting a Low-Carbon Future? Are Multilateral Development Banks Supporting a Low-Carbon Future? More than 190 countries committed under the Paris Agreement on climate change to hold global average temperature rise to well below 2⁰C (3.6⁰F). The multilateral development banks (MDBs) will play a crucial role in enabling countries to finance the infrastructure and energy systems of the future. While much attention has been paid recently to the MDBs as providers of climate finance, that’s only a fraction of their portfolios. The MDBs recently provided about $25-28 billion per year in climate finance by their own accounting, but they also provide hundreds of billions for everything else, including for energy supply investments. It is therefore time to look beyond the slice represented by climate finance and examine the larger picture. It’s time to ask: To what extent are MDBs financing projects that are consistent with a low-carbon future? 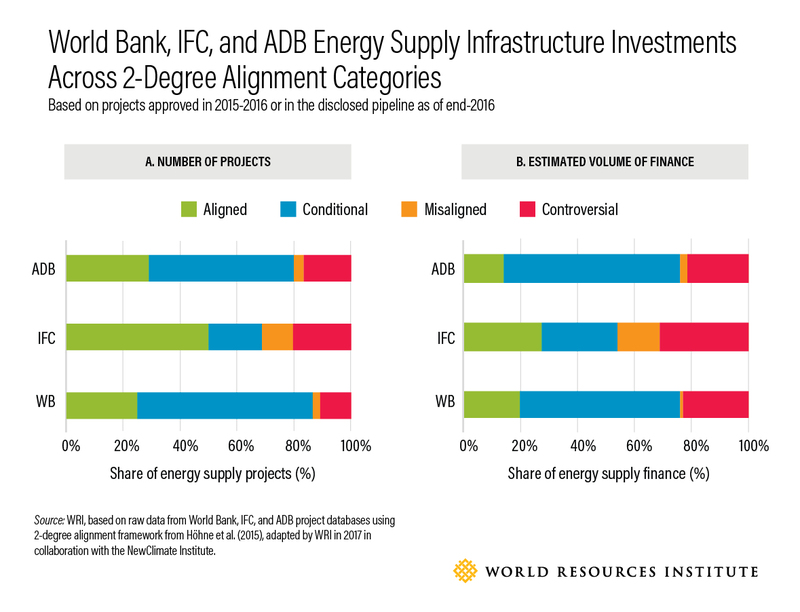 WRI’s new working paper looks at energy supply investments of three MDBs: the World Bank, International Finance Corporation (IFC) and Asian Development Bank (ADB). We analyzed recently approved (2015-2016) and planned energy supply projects—nearly 300 infrastructure projects, representing $35 billion of finance in developing countries. We found that while only a small fraction (3 percent) of this financing is clearly misaligned with the goal of limiting temperature rise to 2⁰C, about half of the projects fall into a “conditional” category; their alignment with a low-carbon future depends on how they’re designed and implemented, and often on the policy context in which they operate. Whether and how this is happening is an important policy discussion for MDB shareholders, MDB management and civil society. How Do Investments Measure Up? 32 percent of projects and 17 percent of finance are aligned with 2⁰C pathways. These are mainly renewable energy projects, plus solutions like the storage of energy in batteries. A lot of this activity was concentrated in solar photovoltaic technology—about 15 percent of projects and 5 percent of the overall finance. 48 percent of projects and 57 percent of finance are conditional. This means that these investments could be consistent with 2⁰C pathways, but only under the right conditions. Natural gas-fired power or electricity transmission and distribution (T&D) infrastructure fall into this category. In fact, investments in electricity T&D accounted for a third of the projects and nearly half of the estimated volume of finance in our review. While well-functioning and managed T&D systems are needed to bring renewables onto the grid and increase efficiency in both the delivery and end use of energy, expanding this infrastructure to bring dirty energy onto the grid—such as coal or heavy fuel oil—without plans to decarbonize can lead to misalignment. Natural gas power generation projects represented 7 percent of projects and 8 percent of finance. If natural gas is to be a true bridge fuel that helps reduce emissions and pave the transition to renewables, the design of the project should anticipate the future shift out of gas to zero-carbon alternatives, make deep gains in energy efficiency, and/or have a plan to incorporate carbon capture and storage (CCS). 5 percent of projects and 3 percent of finance are misaligned with 2⁰C pathways. These projects include new coal-fired power plants without CCS and heavy fuel oil power plants. This means that technologies and investments were aligned in some 2⁰C scenarios, but not others, sometimes because of significant environmental and social risks. For example, large hydropower plants may produce far fewer greenhouse gas emissions than fossil fuel-based plants, but they typically require dams and flooding, which displace communities and destroy natural habitats. In addition, hydropower plants with large reservoir areas in relation to electricity production can produce considerable greenhouse gas emissions. The majority of infrastructure projects considered in our analysis are 2⁰C-aligned or could be aligned if the right elements are in place. But that’s a big if—getting the project details and supportive policies and actions right will be key to achieving a low-carbon future. MDBs and countries will need to collaborate to properly design and implement these projects while ensuring they fit with countries’ decarbonization plans and enhance their ability to ramp up ambition over time. While this is an early analysis and only a snapshot in time, it raises important policy questions for shareholders and management. MDBs, their shareholders and civil society should urgently consider how to deploy technologies that unambiguously align with 2⁰C scenarios, how to put in place the conditions that foster alignment with such scenarios, whether and how to deploy controversial energy-supply technologies, and how to manage the risk of technologies that lock in high-carbon energy for long time periods. The MDBs will be central to helping the world finance the energy transition we need to meet the climate challenge. But that will only happen if the MDBs’ entire portfolios—not just the climate finance portions—support a low-carbon future. LEARN MORE: Download the full working paper, Financing the Energy Transition: Are the World Bank, IFC and ADB Energy Supply Investments Supporting a Low-Carbon Future? Asian Infrastructure Investment Bank Releases New Environmental and Social Standards. How Do They Stack Up?